This book is, to me, not about ‘Fat Burning’ but about health and being healthy. I would not have given it a second thought given the title as I am not particularly overweight. A friend said they had read it and were losing weight. I was having some allergy problems and was looking for something that would help handle the cause of this as opposed to fixing the symptoms. I did a little research, read a couple of reviews and thought that it may answer some questions that I had on the subject. The beauty of this book is that the author is not speaking the lingo of his peers but in a language pretty much anyone can understand. The information in the book allows one an understanding of the body and how some important parts work together. There are some pretty cool and simple ways to ‘fix’ those things that are ‘wrong’ but what I liked was, that given the knowledge, I can decide for myself how and to what degree I want to apply the solutions that Dr Berg provides. And for me, I can simply apply many of the principles without going on a weird diet(not that his solutions are weird at all). Berg debunks many diet fads by telling exactly what they are doing to the body and why many cause a person to gain weight afterwards. I’ve always seen a goal of being healthy being more important than losing weight and ‘The 7 Principles of Fat Burning’ gives one the precise information to do just this. So, if you would like information that allows you to make intelligent decisions about your body and its health I highly recommend reading this book. Ever since my liver crashed for reasons the doctors couldn't not determine and I learned (very quickly) as much about livers and diseases thereof I have remarked that what people commonly call a beer belly should more accurately be called a liver belly as it is caused indirectly by over consumption of alcohol damaging the liver. 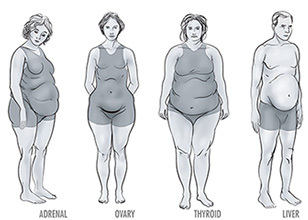 Glad to see this in the illustration and also the other organs properly identified with different distributions of excess body fat. Have learned all of this through a different path and varied sources of information over the past decade while in search of the root causes of some other issues of my own. It is encouraging that more and more good information is being shared that takes the causes seriously as opposed, as you say to focus only on the masking of symptoms which is unfortunately still the norm of the medical establishment. And a lot of the general public for that matter.